Dhaka, 29 May, Abnews: The Executive Committee of the National Economic Council (ECNEC) today approved five similar projects to improve the respective district highways into due standard and width of Rajshahi, Khulna, Rangpur, Chattogram and Sylhet Zone with an overall outlay of Taka 3,368.21 crore for these five projects. 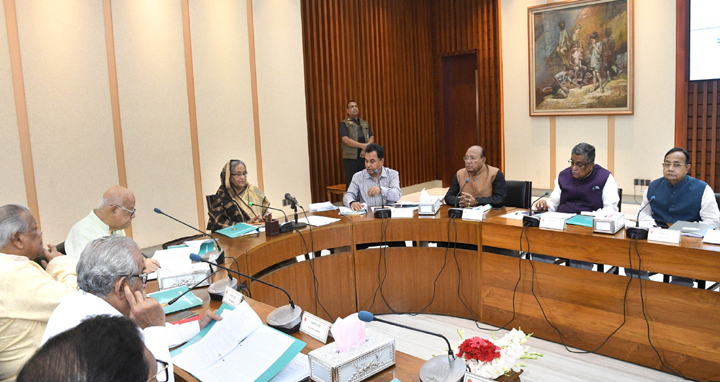 The approval came from the 25th ECNEC meeting of the current fiscal year held at the NEC Conference Room in the Capital’s Sher-e-Bangla Nagar area with ECNEC Chairperson and Prime Minister Sheikh Hasina in the chair. Briefing the reporters after the meeting, Planning Minister AHM Mustafa Kamal said a total of 13 projects were approved today involving an overall estimated cost of Taka 9,518.62 crore. “Of the total project cost, Taka 6,854.69 crore will come from the GoB portion, Taka 71.59 crore from the organization’s own fund while the rest of Taka 2,592.34 crore from project assistance,” he added. All the approved 13 projects are new projects. The Planning Minister said out of the five similar projects for upgrading the district highways into due standard and width, Taka 766.58 crore will be spent for the Rajshahi Zone, Taka 756.80 crore will be spent for the Khulna Zone, Taka 654.43 crore for the Rangpur Zone, Taka 652.10 crore for Chattrogram Zone while Taka 538.30 crore for Sylhet Zone. The Roads and Highways Department under the Roads and Highways Division will implement these five projects. The main objectives for upgrading the district highways of these five zones are to repair the damaged portion of the highways as well as rehabilitate those and thus ensure a safe, comfortable, time and cost efficient road network. The day’s ECNEC meeting also approved Construction of Cumilla north (Bangladesh) 500 MW HVDC back to back station for transmitting power from Surjomoninagar (Tripura) to Cumilla north (Bangladesh) with Taka 1,342.26 crore. Of the total project cost, the Asian Development Bank (ADB) will provide Taka 1,019.79 crore as project assistance. The main objective of the project is to ensure necessary infrastructures for importing 500 MW of Power from Tripura and Assam of India to meet the growing demand in the eastern region of Bangladesh. The main project operations include construction of 500 MW HVDC back to back station in Cumilla north having 400 KV GIS switchyard. Power Grid Company of Bangladesh Limited under the Power Division will implement the project by June 2021 at Cumilla sadar. The Planning Minister said Prime Minister Sheikh Hasina, in the meeting, underscored the need for reopening all the closed down river ports of the country to infuse dynamism in the activities centering the river ports.